Looking for best ways to play audiobooks? 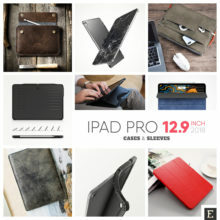 Use your Android phone or tablet and one of the apps listed below. Audiobooks are getting more and more popular. 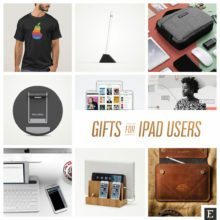 The main reason for their success is the fact that they are more accessible than ever before. You don’t have to buy a CD with the audiobook version of the new novel from your favorite author. You don’t need to keep that old CD player just to be able to listen to audiobooks. Many people have recently discovered the joy of playing audiobooks on their smart speakers, such as Amazon Echo, Google Home, or Apple HomePod. You don’t have to buy a smart speaker, though. All you need is a free app. 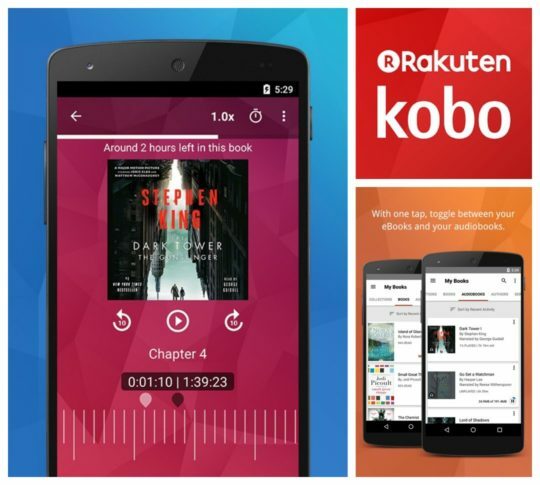 If you have a phone or tablet powered by Android, you’ll find plenty of audiobook apps. Download one, and you’ll be able to listen to audiobooks in a matter of minutes. 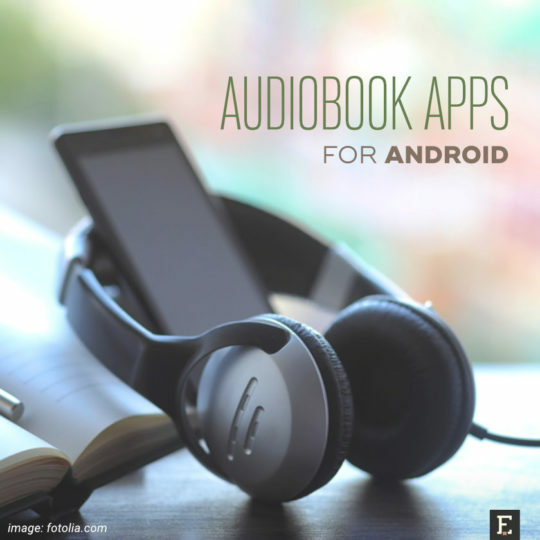 We list the most popular and interesting Android audiobook applications in the below. There is one thing you’ll need to remember about audiobooks. They take much more space than ebooks. A single audiobook can “eat” the same amount of space as a movie (from 100 to even 500 MB). It’s because they don’t take an hour or two, but five or ten. If you’d like to share your experience with audiobooks or would like to recommend an app that is missing, please use the comment section below. Our readers and we are also waiting for you in social media. 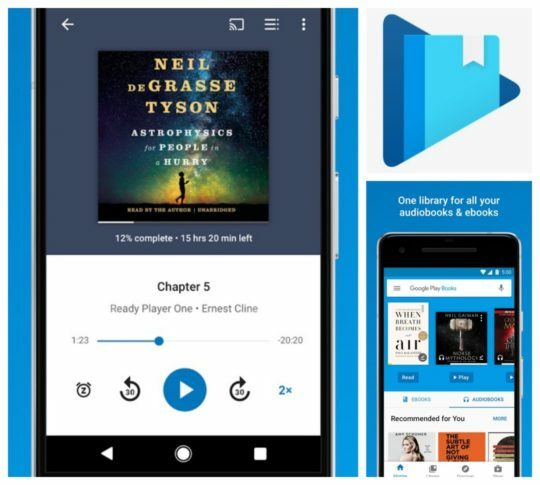 Google brought audiobooks to Play Store in January 2018. The same day, Play Books app in the Android Store was updated with audiobook support. The app is now a usage hub for different kinds of digital content: ebooks, textbooks, comic books, and – eventually – audiobooks. The content you can access via Google Play Books Android app syncs across all devices that you have connected to your Google account, for instance, another Android device or the web browser. The sync capability also applies to audiobooks. It means that you can start listening to an audiobook in a browser on your laptop and continue from the last location in your Play Books app on your Android or iOS device. I have tested it on a free audiobook from Google Play Store (Mindfulness by Mark Williams), and it works beautifully. The audiobook you start playing in the Play Books app is being downloaded to your device. Thanks to that, you will be able to listen to it when you are offline or without using your cellular data. If you have tried audiobooks and realized they are your thing, you should try Audible. It’s the largest and most advanced audiobook service in the world, offering exclusive titles, audio shows, and book series. Audible lets you choose the preferred way of getting the content. You can either buy audiobooks the traditional way (one by one) or get them via subscription which costs $14.95 per month and enables you to download one audiobook for free and get other titles 30% off the list price. On top of that, if you are a member of Amazon Prime extensive subscription platform, you have free access to Audible Channels – a carefully curated selection of original programs, lectures, and audio editions from top sources. 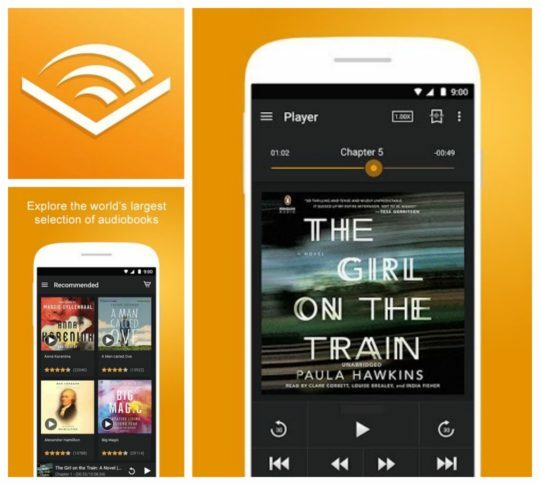 Once you decide to give Audible a try, you can access and play your audiobooks on the Android phone and tablet using a dedicated Audible app. 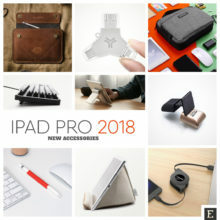 The app is free and ad-free, and syncs audiobooks in your account between all connected devices. You can listen to audiobooks even if you are offline. The player offers superior audio quality without interruptions, enables you to adjust the narration speed, and lets you quickly move forward or backward. 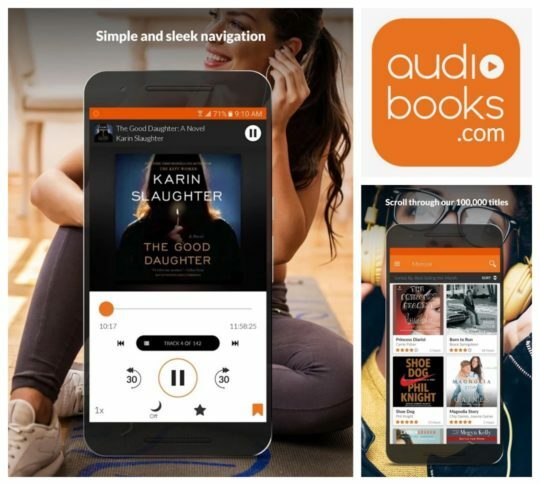 The app also offers extended access to an Audible store, with advanced recommendation tools, and ability to explore Audible’s original shows, comedy, and other audio channels. LibriVox is a volunteer-powered service that offers free audiobook versions of classic books that entered the public domain in the US. 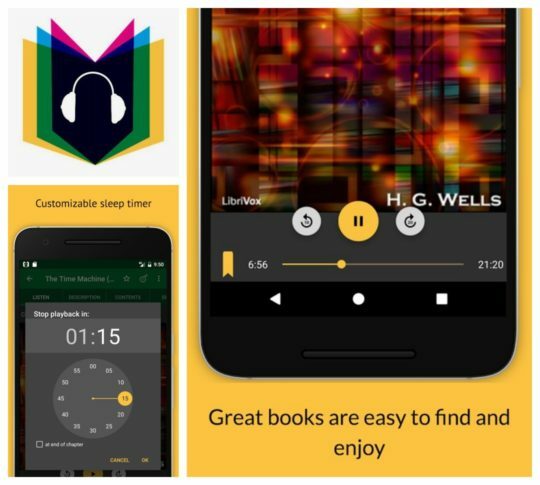 LibriVox Audio Books Free is an Android app that’s developed by a different company (Book Design). Nevertheless, it offers free audiobooks from LibriVox as well. 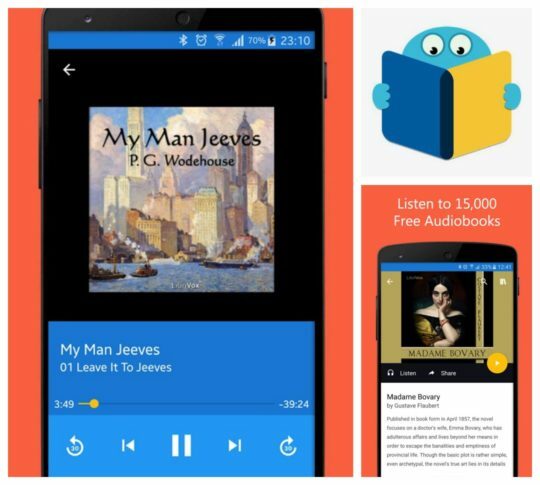 Currently, the app offers over 24,000 free classic audiobooks. If you live in the US, you will also have access to over 75,000 paid audiobooks, including new releases and bestsellers. 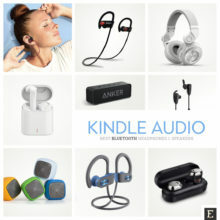 The app gives easy access to Bluetooth controls so that you can easily connect your Bluetooth-enabled speaker or headphones. Android Auto and Google Cast are supported. If you have ever borrowed an ebook from your local library, you will love Libby. Developed by OverDrive, Libby is a next-generation application to manage the content you borrow from public libraries. Yes, the plural was used deliberately. You can use more than one library card, and all the content from different libraries will appear in the unified, user-friendly library. Most importantly, if your connected libraries offer audiobooks, you can borrow them just like ebooks. And you can play them within the app. 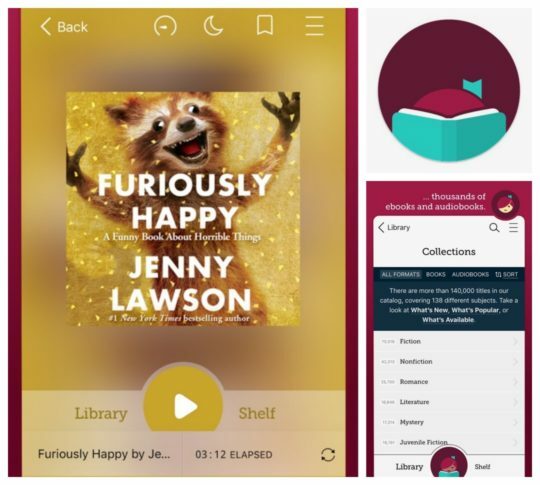 Libby is a great way to listen to free audiobooks of newly released books and hot bestsellers, not only free public domain titles. The catalog of ebooks and audiobooks offered by your public library is not as large as on Audible (and you may wait in a queue to borrow most popular audiobooks), but it’s a simple, enjoyable – and most importantly – legal way to listen to audiobooks for free. Are you looking for an audiobook service that gives access to both free titles and paid bestsellers? Audiobooks.com is the right place to check out. The site offers over 100,000 premium audiobooks. Over 7,000 can be downloaded for free. 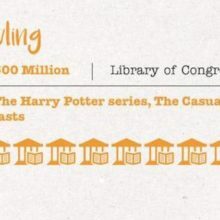 The company claims hundreds of new audiobooks are being added to the catalog every week. You can access all your tracks using Audio Books app available in the Google Play Store. Audio Books app offers quality sound. You can adjust narration speed, and chat with customer service from within the app. 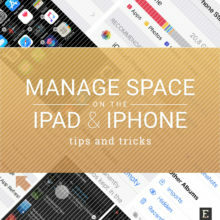 An interesting thing is the ability to add bookmarks and create notes with memos. You can enjoy audiobooks on the road with Android Auto or listen at home on the Sonos smart speaker. If you are only interested in free ebooks and audiobooks from legal sources, you can take a look at Oodles. The app offers over 50,000 ebooks and 15,000 audiobooks from the public domain. They are classic books from authors such as Jane Austen, Mark Twain, or Victor Hugo. Don’t expect newly released titles or all-time bestsellers, though. As I said, only the public domain titles are offered. In Oodles, you can find books in either English or Hindi. You can listen to audiobooks even if you are offline. If an ebook is also available as an audiobook in Oodles, the app will link both formats. If your primary source of ebooks is Kobo, you should look no further if you are also getting interested in audiobooks. 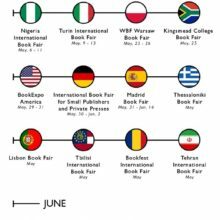 Kobo added audiobooks to their e-bookstore in September 2017. Now, in this single online destination, you can buy both ebooks (including comic books and textbooks) and audiobooks. And Kobo for Android is a single application you can use to enjoy everything you’ve purchased in the Kobo store. The app works the same way as Google Play Books. 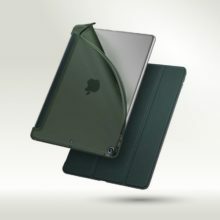 It’s either a book reader or an audiobook player, with the common library and access to the store. The audiobook player is beautifully crafted, with a nice slider that makes it easy to navigate through the book with one touch. You can slow down or speed up the narration, as well as see how much time is left. A good thing about the Kobo app is that it lets you browse the Kobo store for audiobook deals, and includes an option to sign up for $10/month audiobook subscription service, similar to Audible. 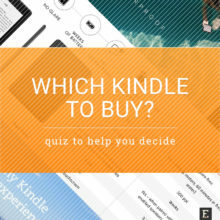 Kindle is one of the most popular book-reading apps on Android. It can also play audiobooks. 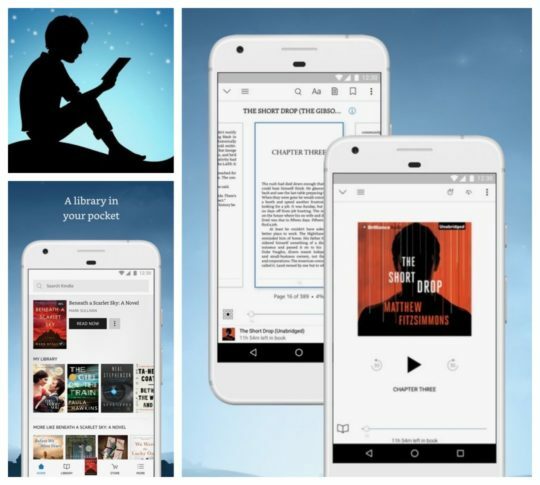 Unlike Google Play Books (which is either a book reader or an audiobook player), Kindle offers a more flexible solution for people who are not dedicated to audiobooks. The way Kindle for Android handles audiobooks is different from other apps. Normally, you have to make a decision. You either buy an ebook or an audiobook. With Kindle, you can buy an ebook and add an audiobook companion for a fraction of the audiobook’s regular price. You have one book in two formats. Now, the magic starts. Thanks to the technology called Whispersync for Voice, you can easily switch between reading and listening. It’s a matter of a few taps. 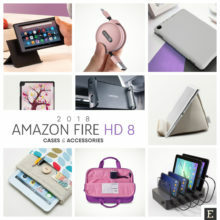 The book is synced between devices so that you can start reading on your Android smartphone, and switch to listening on your Amazon Fire tablet. Kindle app with the option to add audiobook companions is a good solution not only for readers who want to have a freedom of choosing the format that suits the mood, but also if you share your Kindle library with other members of your family.